effects of our isolation from it. "Born in the town of Cockermouth in 1770, William Wordsworth's first home was in the Lake District, and it was one of many he would have there. Cumbria was where he spent most of his life, where he was schooled, raised his own family, wrote much of his poetry, and where he died in 1850, at his last home, Rydal Mount. Though Wordsworth would spend time away from the area at various points throughout his life, he would never be away from the Lakes for long, and, in the light of the thousands of lines of poetry he devotes to his and others' experiences there, we may rightfully doubt whether the place ever left him in mind even when the author was parted from it in body." As one who was born and raised in an area somewhat like England’s Lake District -- but lacking historic features comparable to Hadrian’s Wall in northern England, of course! -- I can appreciate Wordsworth’s attachment to the area of his birth. For a time, my family lived in a house on the east side of Mt. Morris, Wisconsin, just southwest of the place where my dad had spent his childhood (see map below). I haven’t lived in that area for about 55 years, and since moving away a county park was created on the “mount” (illustrated above). I still remember, however, the delightful times I had as a child, wandering around on the “mount” with my brothers. As the topographic map below shows, the “mount” is a mere hill, and there is a chain of lakes in the area as well. (Source for map.) 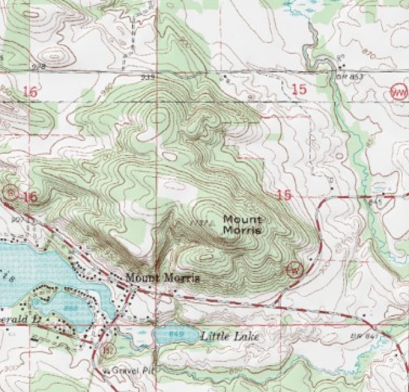 (I should perhaps note that Lake Morris consists of five named lakes, not named on the map below respectively (from left), Alfson Lake, Russell Lake, Hannah Lake, Morris Lake, and Emerald Lake. I think of that time as idyllic, although I’m sure that my memory is deceiving me! However, as that area, and those times, are still in my mind, these many years later, it’s obvious that living there made a deep impression on me. I would even assert that growing up there had a profound influence on my personality. I don’t claim that I have become an Ernest-like person -- alluding to Nathaniel Hawthorne’s “The Great Stone Face” -- but do believe that my personality would be somewhat different had I grown up in a different situation -- an urban one, in particular. I don’t know if Wordsworth perceived his home area as sacred, but as I roamed Mt. Morris, I often thought of the Native Americans who had roamed that area 1 decades earlier in search of game, and I almost sensed their presence while doing my roaming. That, in conjunction with the sights, sounds, and scents of the area gave me the sense that I was walking on holy ground. It was, therefore, easy for me to understand why the Bible is filled with holy mountains. Not that Mt. Morris was anything but a hill, 2 but for a young boy, it was more than that! If one is living in a city -- a large one in particular -- one’s environment consists primarily to buildings and streets (i.e., human-made things), and it is not only easy to forget about Nature’s power, but Nature’s very existence! As a consequence, it is virtually impossible to develop an esthetic appreciation of Nature, so that it is virtually impossible that one will come to perceive Nature as sacred, besides having power. In lacking a sense that Nature is simultaneously beautiful, powerful, and sacred, it is understandable that one’s actions relative to Nature will be thoughtless: One will engage in actions that affect Nature adversely without even knowing it! Wordsworth could not have done so, first, because of the respect that he had for Nature -- but also because the technology of his time was not “advanced” enough to enable him to harm Nature: The Industrial Revolution had gotten underway during his life, but had not “progressed” sufficiently to enable him -- or anyone, for that matter -- to do much damage to Nature. This changed during the last century, however, as the use of coal, and then petroleum, became increasingly important -- in part because of technological “advances” that made use of petroleum especially, in part because of a growing population -- both factors contributing to an increase in demand and, therefore, increased production. The technological developments that occurred had, as an unintended (but important!) consequence, a geographical reorganization of the population -- from a scattered and basically rural population (engaged primarily in agriculture) to a concentrated population (engaged in manufacturing and service activities). What this meant, of course, is that more and more people were becoming more and more removed physically -- but also mentally -- from Nature. How that impact, in turn, had relevance for their own lives. Our actions (the burning of fossil fuels, and deforestation activities in particular) are causing global warming. Few seem to be aware of that strong possibility, and go on living their lives as if “there is no tomorrow”! There will be a tomorrow, of course, but it’s not likely to be the tomorrow that most expect it to be! Members of the Ho-Chunk tribe, I believe; see this map. 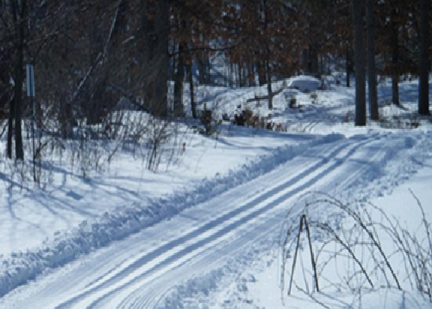 When I was young, they were referred to as the Winnebago, and Lake Winnebago, to the east of Oshkosh (where I attended college) was named after this tribe. Oshkosh itself was named after Chief Oshkosh [1795 – 1858], of the Menominee tribe. There having been, to my knowledge, no attempts to make it into a mountain, as was the case in my favorite movie.